The stretch of 9th from U Street to the Convention Center makes for an interesting walk. It’s a very exciting time to live close by, with development evolving in a truly organic way. From the Little Ethiopia of Etete, Chez Hareg, Habesha Market and Queen of Sheba, to glorious grimy dive DC9, past the beautiful boys at BeBar, vegetarian haven Vegetate, on down to the weirdness of the Convention Center’s cold empty glass. All along are pockets of blight, boarded up houses mostly owned by Shiloh Baptist Church. On this fascinating street has dropped 1905, a small second floor bistro. 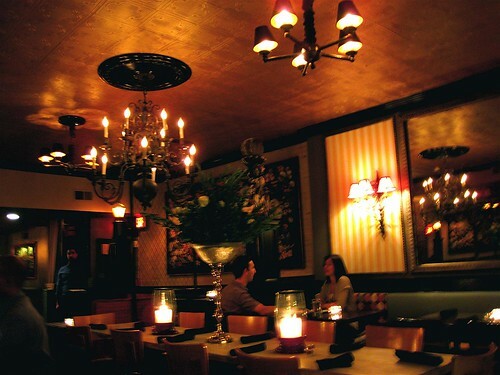 The vibe is rather like visiting a quirky friend’s dinner party, whose decorating style is rustic opulence on a budget. On weekdays it’s a relaxing spot for a quiet candlelit meal or drinks at the cosy bar. On weekends the communal table ramps up and it’s far livelier, with live jazz on Thursdays at 10pm. Whichever you prefer, the staff is committed to making sure everyone has a good experience and keeps a friendly atmosphere. The menu features kicked-up bistro and comfort food with a French twist. Like the space, it’s small, and I wonder if it will change seasonally. The standout for me is the “Grilled Merquez with Polenta and Piquillo Peppers.” I’ve had it twice and it will be hard not to have every time. Having comforting polenta and spicy lamb sausage together – well, it’s like kissing a shy boy and finding out he is a bad boy. Seriously, that’s my metaphor and I’m sticking to it. My first visit I tried the “Grilled Sirloin with Parmesan Potato Croquette and Pommery Mustard Jus” – good, but something off that I couldn’t place. A friend I ran into there had the same reaction. Maybe it’s dry-aged and we’re too unsophisticated to tell, but I like my meat with a luscious mouth feel and this was too firm for me. 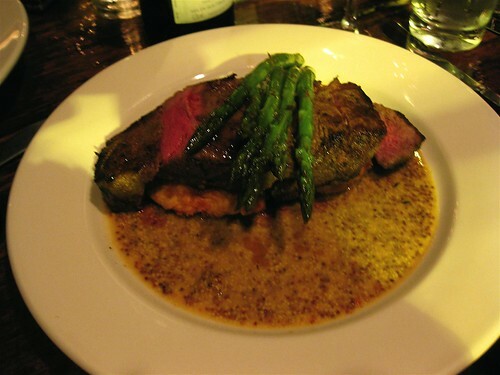 The mustard sauce was tangy and a great complement, but may be a bit much for those expecting just a taste – the steak swims in it. Surprisingly the best thing about this dish was the little potato croquette hiding underneath – addictive taste. Another night featured the “Seared Sea Scallops with Parsnip Puree, Haricots Verts, Mushrooms and Lemon Butter.” The scallops were divine, fat and plump, though it seemed gilding the lily to put them on top of creamy parsnips, just too rich for me. But there was another accompaniment surprise - the green beans and mushrooms were absolutely delectable (and I am not usually a fan of the bean). Someone in the kitchen is really thinking carefully, almost lovingly, about side dishes. Of all the dishes friends have tried, the one they rave about is the “Pan Roasted Gnocchi with Wilted Greens and Duck Confit.” It’s hard to do gnocchi right – try it yourself sometime - they can so easily become chunky heavy bricks. 1905′s are perfect little pillows. All in all, I think 1905 is a lovely addition to 9th Street’s options and I’m looking forward to returning to try more. 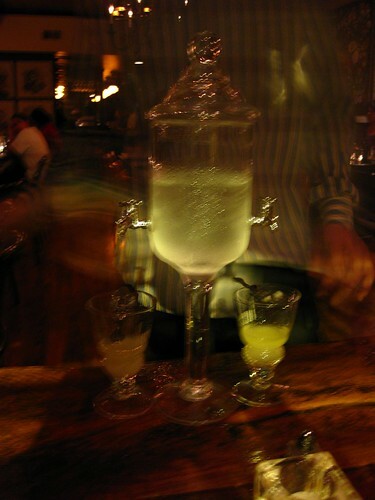 And if you like absinthe, you can cap off the night by having an old-fashioned pour before sauntering on home… though it may impede your photographic skills. 1905 is located at 1905 9th Street NW. Closest Metro stops: U Street/African-Amer Civil War Memorial/Cardozo Station or Shaw-Howard University Station (Green line). For more information, call (202) 332-1905. Agreed on both the polenta and the gnocchi–amazing, both!! And the atmosphere is lovely. Jenn, you didn’t mention the French Lily or whatever it was called!